Your horse can suffer from a wide variety of injuries and ailments, but horse laminitis is one of the most painful and is very serious if untreated. What is equine or horse laminitis? Laminitis is a painful condition of the feet. The actual word laminitis means ‘inflammation (itis) of the sensitive laminae (lamin)’. The laminae are the membranes that hold the bone of the foot (the pedal bone) in place inside the foot. When they get inflamed your horse feels as if its standing on a very badly bruised fingernail. Laminitis can come on very quickly or start slowly. Horse owners can suddenly find their horse lying on the ground unable to rise because of laminitic pain or they may discover their horse is a little lame with some heat in one or more feet. Generally laminitis will start as an acute event. This means that it starts quite quickly and causes quite a lot of pain. If the condition is treated quickly it can be cured quickly and be all over in 10-14 days. But if left untreated or not treated quickly and effectively; and if preventive measures are not used it can quickly become a chronic case. Chronic laminitis is the type of problem that drags on and on and never really goes away. The horse has repeated mild attacks of the disease and the feet are so changed that any change in diet brings on the problem again. A chronic laminitic horse or pony may still get one or two acute attacks each year. There is an alteration in blood flow in the foot during an attack of laminitis. Although more blood is pumped into the feet by the heart, it doesn’t reach the laminae which become starved of oxygen. If the process continues for a long time then the laminae die, causing a breakdown of the junction between the horny and sensitive laminae. This is painful, the pain itself leads to a further constriction of the blood vessels. Due to the weakened attachments the pedal bone may rotate or sink through the hoof. 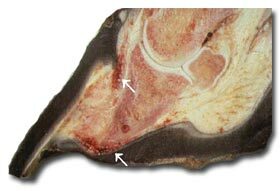 The image above right shows the sagittal section of a horse’s foot with severe chronic laminitis. The distal phalanx has separated from its connection to the inner hoof wall and has descended into the hoof capsule causing the sole to bulge downward. Note: the haemorrhage and bruising in the corium at the coronet and sole (arrows). Should I exercise my laminitic horse? No forced exercise – in the short term. Do not exercise a horse which is showing any signs of pain. 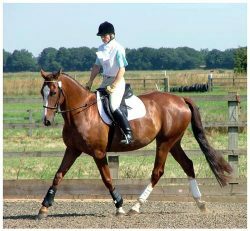 Allow free exercise – have the horse in a large area of at least 20m x 20m with a soft surface and shade. Allow easy access to limited feed and plenty of water. Provide company close by. Lead in hand, walking carefully, in the longer term. Only if the horse is free of pain. Laminitis – Outdated Thoughts and Practices. During the acute stage of horse laminitis exercise was once thought to be beneficial; however, there is already a great increase in blood flow to the foot during the acute stage and the tissues which are bonding the insensitive and sensitive laminae are very fragile and easily weakened. Too much exercise, to soon, causes further tearing of the remaining laminae and increases the damage. Ideally your horse should be kept in an area big enough for it to move around in, if it wants to. A normal stable, (10 or 12×12 feet), is too small as standing still is not ideal. Although Inflammation is part of the repair process, it is necessary to minimise the inflammation and associated pain. If possible minimise or eliminate anti-inflammatory drugs from the horses’ treatment and re-introduce some controlled exercise such as light walking in hand. Eventually very light exercise will increase blood flow and metabolism, so that the healing process progresses. Balanced trimming and shoeing are also important factors in increasing the horses comfort and returning blood flow to the affected parts of the foot through regular movement. a horse may return to normal activities in 30 days in very mild cases and several months to one year or more in the most severe cases. The healing time taken, is entirely dependent upon the individual horse and its response to treatment. Some horses never become 100% sound again. If a woman who cymbalta 40 mg is pregnant comes into contact with..